With the 2016 Ford F-150, owners enjoy an excellent mix of everyday practicality and rugged ability. That means you stay comfortable when running around town, but are always ready to take on tough jobs as they arise. To help buyers find the truck that best suits them, Ford offers six distinct trim levels: XL, XLT, Lariat, King Ranch, Platinum and Limited. Four different engines are available for the 2016 Ford F-150, offering just the right kind of power and efficiency. One is a 3.5-liter V-6, which puts out 282 horsepower and 253 lb.-ft. of torque. It comes with sequential multi-port electronic injection to make the most of fuel. Next up is a 2.7-liter EcoBoost V-6. Despite its smaller displacement, the engine cranks out a peak 325 horsepower and 375 lb.-ft. of torque. The engine uses high pressure direct injection. A 3.5-liter EcoBoost V-6 puts out 365 horsepower and 420 lb.-ft. of torque, allowing the 2016 Ford F-150 to take on even bigger jobs. The final option is a 5.0-liter V-8 engine, producing up to 385 horsepower and 387 lb.-ft. of torque. All four engines are mated to a six-speed automatic transmission and come with two-wheel drive standard, with four-wheel drive available. Ford designed the 2016 F-150 for tough environments, with a number of standard and optional features that help owners get the job done. Several configurations are available, but all come with a fully-boxed steel frame that includes eight crossmembers made of high-strength steel. The cab and box are made of high-strength, -military-grade aluminum alloys for durability and efficiency. 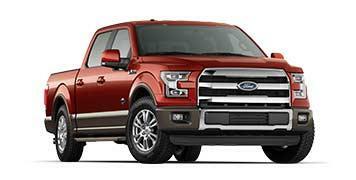 This innovative design means the truck is up to 700 pounds lighter than the previous generation of the F-150, improving acceleration, towing and hauling capabilities. Speaking of towing, Ford makes it easier than ever to back up the 2016 F-150 with a trailer attached. The available Pro Trailer Backup Assist features a knob that users turn left or right to indicate what direction they want to turn while reversing. The intuitive design combines with a rearview camera, showing the driver a clear view behind the truck. No other brand offers this groundbreaking technology. Those who want the rugged capabilities of the F-150 combined with top-shelf luxury get just that with the new Limited trim. The outside of the truck is set apart from the rest of the lineup by unique design elements, such as the satin finish grille, satin chrome handles and 22-inch polished aluminum wheels. Occupants sit on black and Mojave leather upholstery, with heated and cooled front seats, plus heated rear seats. Drivers enjoy quite a few conveniences, such as an auto-dimming rearview mirror, adaptive cruise control with collision warning and brake support, a heated steering wheel, a lane-keeping system and voice-activated navigation. See our inventory and find your Ford F-150! Contact Us to test drive a Ford F-150 Today!